Raschel Knitting Machine (WMH) - Wei Meng Industrial Co., Ltd.
With extensive experience in net machine manufacturing, Wei Meng is confident of offering customers quality raschel knitting machine. 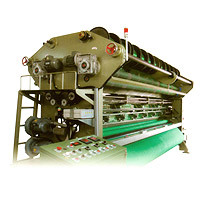 The knitting machine contains the features that facilitate the operation. Adjustment can be made to produce the textile of various thickness and textures. In addition to raschel knitting machines, Wei Meng provides customers with a wide variety of net machines that meet individual customer's requirements. Applicable yarn: HDPE flat yarn, monofilaments, polyester, rayon, nylon, TC, TR. Working Width: 130" - 210". Gauges: 2 - 18 needle per inch. Warp supply system: From: Warping beams / creel stand / slitting extension M / C.
Performance: 300 - 600 RPM. Number of bars: 2 - 8 ground bars, (2 - 16 pattern bars available). Main motor: 2.2kw - 7.5kw. Machine weight: 4,500kgs - 7,000kgs. Rugged, distortion - proof welded steel construction. Main drive by special cams, which are dynamically balanced, and run in oil in the machine bed. Machines available for widely different applicants. Applications from fine mesh to coarse mesh available. Suitable for round & yarn & flat yarn. Lower investment and high returns. 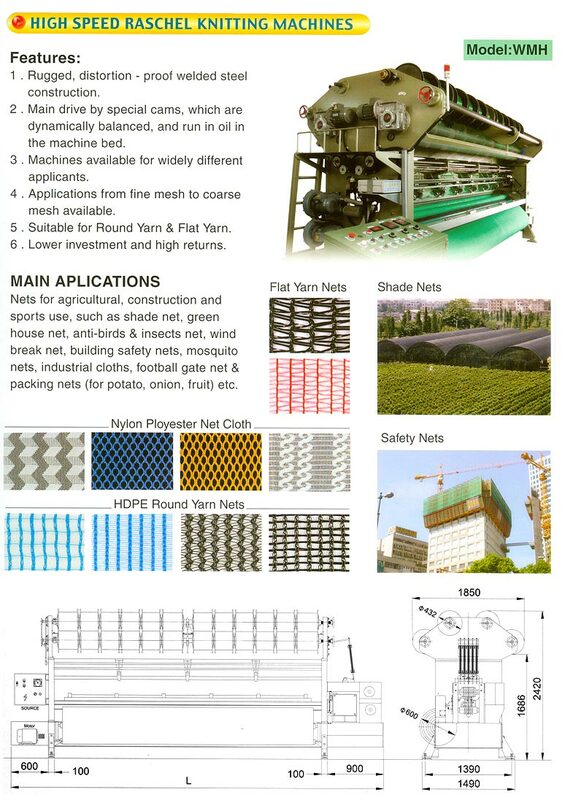 Nets for agricultural, construction and sports use, such as shade net, green house net, anti-birds & insects net, wind break net, building safety nets, mosquito nets, industrial cloths, football gate net & packing nets (for potato, onion, fruit) etc. 17-3, Neighborhood 2, Chih-Lan Village (32743), Hsin-Wu, Taoyuan, Taiwan, R.O.C.